This article addresses the increase of black immigrants in Massachusetts indicating that the population of new citizens is extremely diverse, or as professor James Jennings says, “It’s not just Jamaicans, Trinidadians and Tobagans, and Panamanians anymore.” The single largest group of black immigrants hails from Haiti. Standing together in Faneuil Hall, they raised their right hands: a nurse’s aide from Haiti, a National Guardsman from Cape Verde, and a giddy couple from Nigeria who later twirled outside with joy. [. . .] Rising black immigration is rapidly reshaping Massachusetts, where the black community is already one of the most diverse in the nation. A third of the roughly 470,000 black people in Massachusetts are immigrants, compared with nearly 9 percent nationwide. Birth rates mirror the shift: For the first time in Massachusetts history, a majority of black babies born since 2008 have an immigrant mother, according to the figures from the state Department of Public Health. The single largest group of mothers of black children, since 2006, have been from Africa. Compared with Asians and Latin Americans, black immigrants are still a relatively small group, accounting for less than 10 percent of 40 million immigrants nationwide and 15 percent of nearly 1 million foreign-born residents in Massachusetts. Haitians are the single largest group of black immigrants, with long roots in the Bay State, and other Caribbean immigrants include Jamaicans and Trinidadians. Another large group are Cape Verdeans, who come from an island off West Africa with long ties to Massachusetts. Newer African immigrants are from Ghana, Kenya, and Nigeria. They are coming for work or study, to reunite with family, or as refugees fleeing famine and war. Researchers say one major pipeline for black immigrants over the past two decades is the federal visa lottery, which grants green cards to people from countries that historically did not have a significant presence in the United States. Since the program began in the 1990s, African immigrants have soared from a relatively small group, 40 percent of whom were white, to more than 1 million people, 74 percent of whom are black. The shift marks the first large influx of black people from Africa since the forced migration of slavery, according to the Migration Policy Institute, a Washington-based think tank. But that could change if Congress dismantles the visa lottery, as lawmakers are considering in various forms of immigration legislation. Black Africans are a smaller immigrant group than black Caribbeans, but researchers say that could change. An analysis by the Institute for Immigration Research at George Mason University for the Globe shows the smaller group of African immigrants is growing faster and members are quickly becoming citizens. 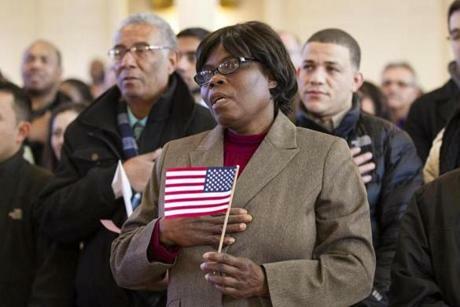 Almost 45 percent of black Africans in Massachusetts were naturalized US citizens, according to census estimates in 2012, up from just 23.6 percent in 2000. More than half of black Caribbeans in Massachusetts were citizens, up from 44.1 percent in 2000.